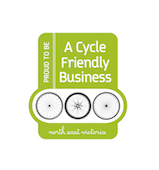 Located on the marvellous Murray to Mountains Rail Trail in North East Victoria, Myrtleford Cycle Centre is a family owned and operated, full-service bicycle shop. Stop by for professional repairs, parts and accessories, hire bikes, cycle tours and more. Cook – cycle – feast. Join a gourmet cycle tour that starts with a hands-on cooking lesson, such as learning the secrets of making authentic Italian gnocchi or a kneading a hearty sour dough bread. Next, work up an appetite visiting local food and wine producers, collecting delicious items for a grand feast. Tours are an easy 10 to 15 kilometre cycle around Myrtleford, and the itinerary can be customised to suit your group (minimum six riders). Myrtleford Cycle Centre has a fleet of comfortable hire bikes suitable for adults and children, as well as a bike trailer, tag-a-long bike and a baby seat for children who are not riding yet. Hire costs range from $25 to $35 per day. Learn the secrets of Italian pasta making and sample delicious local fare on this 10 kilometre cycle tour of Myrtleford. You will prepare gnocchi in a dedicated kitchen at Delizie Café Deli, then work up an appetite visiting local Pedal to Produce providers, collecting more delicious food and wine for your feast. Most cycling is along the fabulous Murray to Mountains Rail Trail. The tour includes hands-on pasta making, morning tea, lunch, food and wine tastings, secret recipes and local tour guide. Bring your own bicycle and helmet or hire bikes available (additional cost). Select from a fleet of hire bicycles at the Myrtleford Cycle Centre, perfect for exploring Myrtleford and the Rail Trail. These bikes are set up for comfortable riding and a friendly team member will help fit you to the best size. Bring your own helmet or use one of the complimentary lids, available in a range of sizes for adults and children. Hire cost for a single bike is $35 for 24 hours. Multi-day hire is available and arrangements to meet you to collect or return hire bikes outside of shop trading hours is available. It is recommended calling to make a booking for busy periods. For children, smaller bikes as well as a baby seat, bike trailer (seats one child) and a trail-a-bike for little tackers can be hired. The baby seat is affixed to a special rack on the back of one of the rental bikes. The trail-a-bike is a tag along attachment for an adult’s bike that the child sits on and pedals at their leisure (no, it doesn’t help the adult’s pedaling). The baby seat rents for $20 per day and the trailer and the trail-a-bike are $25 daily.